World Turtle Day, May 23, is an annually observed awareness day that aims to raise attention, knowledge and respect for turtles around the world. Here, in the Maldives, precious Sea Turtles are one of the frequently spotted residents of the underwater world. Guests who enjoy snorkeling and diving around the lagoons often spot the 5 Sea Turtle species that are most prominent in the Maldives. Namely, the Green Sea Turtle, Hawksbill, Olive Ridley, Loggerhead and Leatherback. Although these have been spotted all around the various Atolls, the Lhaviyani Atoll is known as the hub for Green and Hawksbill Sea Turtles. 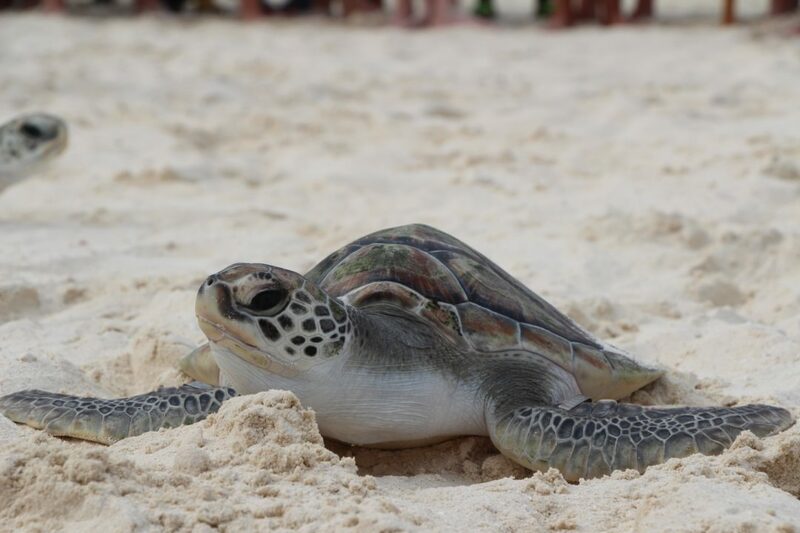 So far, 170 Green Sea Turtles and 103 Hawksbill Turtles have been identified. Hawksbill Turtles are known to frequent Komandoo Island Resort & Spa’s House Reef, where 24 of the 103 identified in the atoll were spotted. 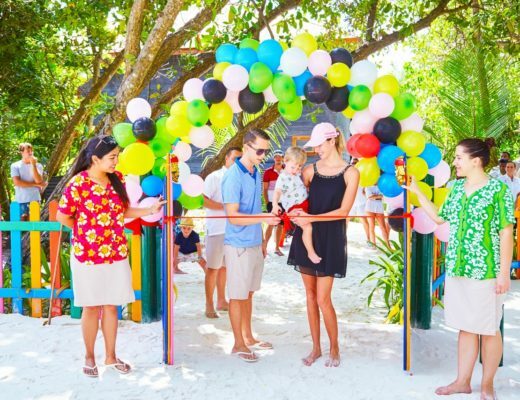 Kuredu Island Resort & Spa dedicated the day towards educational tours and the highlight of the day, the release of rehabilitated Sea Turtles with Dr. Stephanie Köhnk, the resident Sea Turtle Biologist and Olive Ridley Project team member. Guests from 5-Star Hurawalhi Island Resort were also in attendance for the special occasion. Hurawalhi has aptly listed Turtle Snorkeling with Marine Biologist as one of their must-do Bucket List holiday experiences. Loggerhead and Leatherback Turtles have been spotted more in the Ari Atoll, were Vilamendhoo Island Resort & Spa is located in the southern most part of the Atoll. 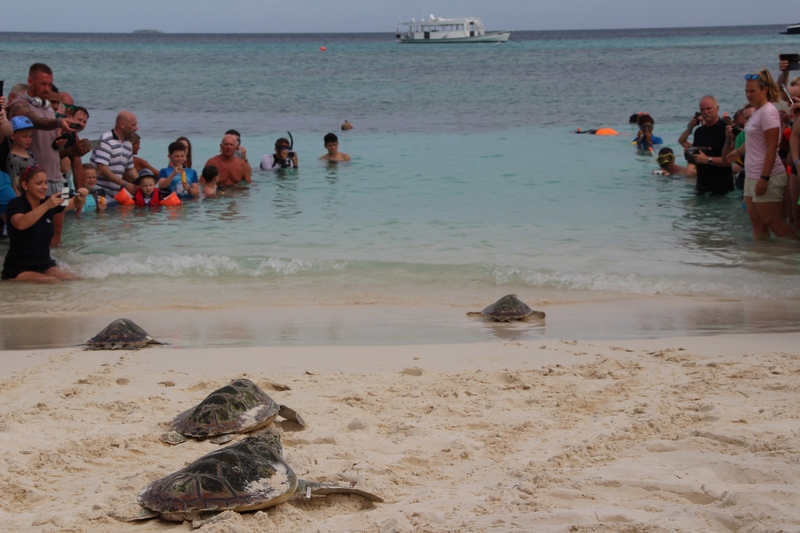 The Resort, known for its fantastic House Reef and marine life, hosted an educational presentation with guidelines to observe when swimming with Sea Turtles, whether snorkeling or diving. Meeru Island Resort & Spa recently introduced the Turtle Explorer Excursion, designed to bring you closer to these ancient creatures in a respectful and mindful way. Guests can explore two of the best reefs of North Male’ Atoll including Turtle Reef. Crown & Champa Resorts across the Atoll are continuously providing guidelines, information and educational tours to raise awareness on our shelled friends. 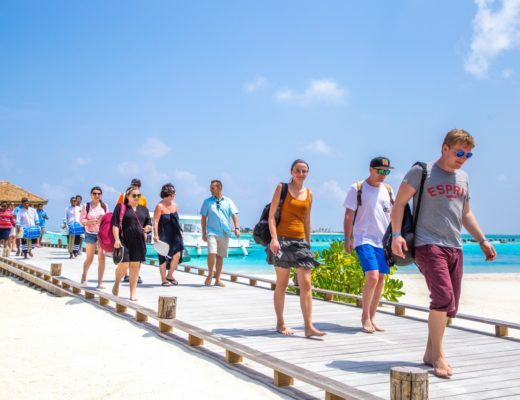 Most notably, the Resorts have made efforts towards protecting Sea Turtles together with organizations such as the Olive Ridley Project, Olive Ridley Project, Marine Savers, Prodivers Maldives, Ocean Group Maldives and Euro-Divers Maldives. Read our 8 quick facts and trivia about Sea Turtles for more information. Award-winning Duniye Spa has become a leader in spa management, wellness and holistic healing in the Maldives and the Indian Ocean at large. Guests across all Crown & Champa Resorts appreciate the quality of enchanting spa and well-being rituals that promote within you a sense of personal paradise. 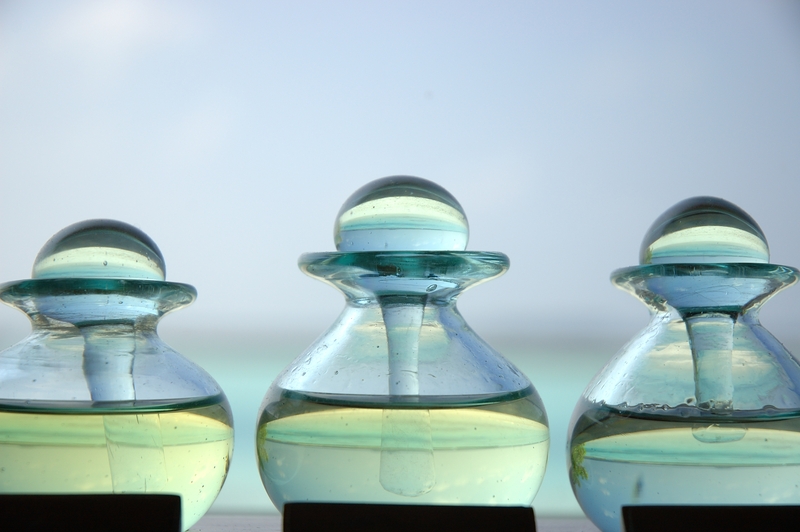 Give yourself the gift of pure bliss during your holiday in the Maldives. Allow the qualified and professional therapists at Duniye Spa to guide you into the ultimate state of calm and relaxation, from therapeutic massages, antioxidant rich natural skin care and freshly prepared body exfoliation. The Maldivian Island Paradise indulgence delivers a true island experience that lingers on long after the treatment itself. The signature treatment makes use of the natural and healing properties of coconut to create harmony between body, mind and soul. 120 minutes of relaxation begin at the sound of the singing bowl and a sea salt foot scrub, followed by a tropical full-body massage with 100% virgin coconut oil. Your body will also be smoothed and coated with freshly ground coconut and vanilla body polish to make your skin glow. Lastly, enjoy a luxurious coconut hair mask combined with an Indian head massage using coconut oil infused with rosemary. As the name suggests, the Heaven on Earth treatment leaves your body, mind and soul floating on a cloud with attentive massages and premium facial products. The 90-minute signature treatment begins with the same Asian-inspired foot ritual to unwind and connect. Allow your body drift away into deep relaxation with a stimulating Balinese massage and the sounds of Tibetan singing bowls. After which, our therapists begin the rejuvenating facial using premium organic Healing Earth™ products, which include the highly celebrated antioxidant-rich Pinotage grape seed oil and most active botanical essence. Certainly a guest favorite and the top most recommended treatment at Duniye Spa, the Sense of Touch is the ultimate indulgence, fusing the world’s best massage techniques inspired by African and oriental healing traditions. This signature treatment is the perfect escape into personal paradise. Expect a deeply relaxing and uplifting massage experience, using ginger and lemongrass herbal poultices to evoke a warm, nutrient-rich relief for tense muscles. This massage works with the body’s natural energy system to harmonise the energy flow, while using the miracle African Potato body balm to revive your senses and enrich your skin with anti-oxidants and deep hydration. Indulge in these top choices for a relaxing, rejuvenating and healing treatment in tropical paradise. 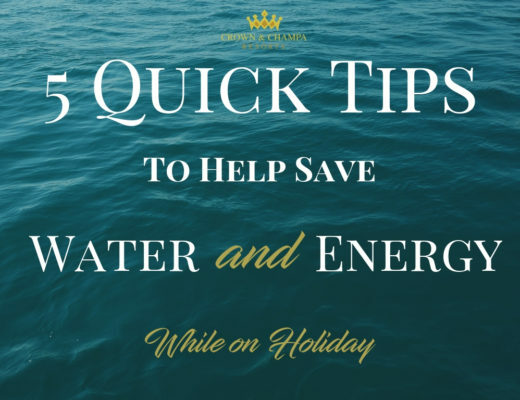 Choose Crown & Champa Resorts on your next trip to the Maldives. Book your treatment via email. 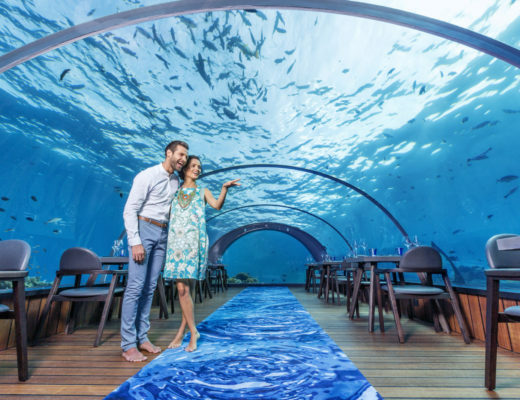 A recent photograph by Mohamed Shareef, General Manager at Mirihi Island, Maldives has gone viral across established online publications such as The Washington Post, The Daily Mail and The Telegraph. National Geographic editors consider the entry one of the best and one of their TOP picks for the contest so far. The photograph, which was entered into the Nature category of the contest, displays a single baby black-tip reef shark swimming through a swarm of sliver sprats in the Island’s crystal clear lagoon, where they learn how to feed in a nursery. Mirihi Island is located in the South Ari Atoll, reachable from Velana International Airport on a 30-minute picturesque seaplane flight. After having been freshly renovated and reopened in December 2014, the small paradise combines modern and traditional elements with a new shine while still maintaining its unique Maldivian character. Voting opens from June 11 – 15, on the NatGeo Travel website for you to choose your favorite photographs from each category. Voters will also be able to select the Peoples’ Choice winners. In addition to the prestigious title, the overall winner will also receive a grand prize of US$10,000 and be featured on NatGeo Travel Instagram. Remember to vote for the iconic capture by Mohamed Shareef, General Manager at Mirihi Island as the National Geographic Travel Photographer of the Year contest. Recruiting and retaining skilled employees is an essential part of the Hospitality Industry, so much so that Resorts & Hotels invest most of their resources on HR Departments to find the right talent and ensure existing employees are well cared for. 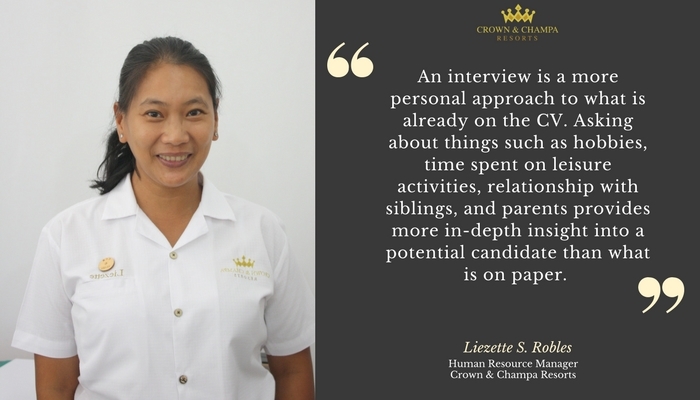 Liezette S. Robles, Human Resource Manager for award-winning Crown & Champa Resorts (CCR) has been with the group for over 7 years and offers insightful secrets to success in Human Resources in the Maldives. Born and raised in Manila, Philippines, Liezette holds a Bachelor of Arts in Psychology from the University of the City of Manila (Pamantasan ng Lungsod ng Maynila). She has extensive experience in the Human Resources Departments of various Resorts & Hotels, including the start of her career at El Nido Resorts in Makati, Philippines in 1995; La Cigale Hotel in Doha, Qatar in 2008; and then joining Crown & Champa Resorts in 2010. The extensive experience provides keen insight into the changes in Human Resources, especially in the Hospitality industry and in the Maldives. “A lot has changed and improved in the recruitment process. Policies and procedures were not followed as strictly as they should have and often no standard forms were established,” she adds. Over the years, CCR has only further grown as a leading group in the Travel & Hospitality Industry of the Maldives. The need to stay up-to-date with policies, regulations and procedures is crucial to a seamless HR Department and to help in finding the right talent. Build a good network with other Resorts and trusted recruitment agencies. Follow standard procedures and policies in the recruitment process. Use interviews as a more personal and in-depth approach to selecting candidates. Foster an open-door corporate culture that encourages employees to communicate. Walk-the-talk and follow what you implement. CCR treats its employees as a family. Most of the long serving employees feel that they have found a second home in CCR. The open door policy is also a big advantage. Anyone can speak directly to the CEO or even the Owners. That makes the staff feel heard, valued, important and mostly, that they belong. Crown & Champa Resorts’ core values are the foundation of HR Departmental goals, resulting in some of the top reasons why CCR employees are happy to work within the group. 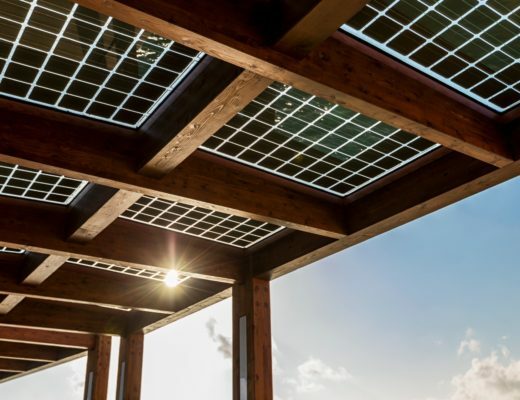 These values also provide for the health, educational, lifestyle and professional wellbeing of employees, as well as the overall growth of the group. Start making improvements within your own department. Read the 5 common hiring mistakes and how to fix them, for successful recruitment and essentially, higher employee retention and employee wellness.